the wonder and terror of soccer. We left the window open during a match in October 2007 and a strange wind blew into the room. Now we walk the forgotten byways of football with a lonely tread, searching for the beautiful, the bewildering, the haunting, and the absurd. There’s a certain quality that comes into the facial expressions of men who, somewhat battered and chastened by life, somewhat rumpled by it, somewhat the worse for wear, nevertheless retain an unusually clear sense of the virtue that guides their actions. Disillusioned more by the world’s failure to endorse their illusions than by any realization of the inadequacy of the illusions themselves, they look out on life with a wary, worried, strong, exhausted resolve. They have long since learned to pretend to disregard the world’s indifference to their ideal—they affect a levelheaded coolness—but it eats at them in secret; the hint of some faint disgust passes constantly over their faces, as if they had swallowed a moral that disagreed with them, as if they suffered from the permanent heartburn of the good. Edward R. Murrow, Morgan Freeman, Tom Wilkinson, Bruce Willis, Charles Baudelaire, Tommy Lee Jones, and Humphrey Bogart all have this quality, some of them only in the movies; as does Arsène Wenger, in something not unlike real life. Incapable either of reconciling themselves to the badness of the world or of finally defeating it, they live with the anxious confidence of men who greatly trust their own abilities but also perceive the vastness of the powers arrayed against them, an outlook which must have been shared by the soldiers who were sent by Xerxes, when his plans were wrecked by a storm, with instructions to whip the sea. The lines that burn on Arsène Wenger’s face burn, of course, for the ideal of beautiful football, for the flowing, attacking game of short passes and skillful ball control to which he has devoted, often with spectacular success, his entire tenure at Arsenal. The almost universal desire of fans to see this sort of football, combined with its perceived rareness relative to the safe, pragmatic, stifling long-ball game, has given Wenger (whose style has, after all, demonstrably won championships) the strange air of a tragic hero who in some performances has managed to survive and triumph at the end of the play. Furrowed and watchful, distrustful, eagle-eyed, he seems to gaze into unspeakable consequences that he can prevent only by refusing to look away. Having lost his innocence in the fight, which he won, to keep his innocence, he now preserves the purity of the beauty he contemplates by balancing it with the grimness of the vision he fears. To be uncompromising is the paramount rule in moments of failure, just as to be relentless is the paramount rule in moments of success. As ever when Arsenal lose, he is surrounded by whispers that attractive football is incapable of winning in the modern game. As ever at such moments, he either does not know or cannot bring himself to say that Arsenal have not been playing especially attractive football, that the real question—since actually attractive football would have likely brought better results—is whether a beautiful style is still attainable in the conditions of the English game. Instead he defends his club by treating “Arsenal” and “attractive football” as synonymous, looks bleakly into the future, and promises success. He promises not to touch the millions of pounds that have been made available to help him strengthen his thin young squad. If Arsenal and beauty are the same word, then why should they ever need strengthening? How can you tell, if the photograph is beautiful, whether it’s meant to depict a sunrise or a sunset? This line is just perfection. 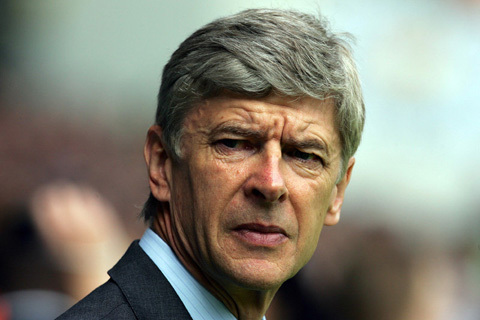 I realised that’s exactly what I sense when I see Wenger in adversity, only I didn’t know it before. What I would really relish seeing would be for Arsene Wenger and Frank Rickaert to trade jobs and to see what the outcome would be for both coaches and clubs. 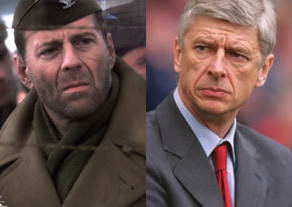 Arsene Wenger ≈ Tommy Lee Jones is among the greatest vague equations I’ve ever had the pleasure of reading. Sorry, Brian, but you lost me at Bruce Willis . . .
co-star Bruce Willis, I think you’ll catch a faint spiritual echo. I’ll see if I can find a picture. Who’s staring mournfully through the barbed wire of the WWII POW camp, and who’s watching his team go down 1-0 to Blackburn? You almost can’t tell, can you? Nah, the guy on the left is wondering what happened to all the money from the Die Hard movies, while the one on the right is wondering how he could have skinned Barca for close to 30 million pounds for Overmars and Petit and STILL be losing out to the likes of Ferguson. Though it did get me to read some more of the piece, at which point I had to stop again at “eagle eyed”. I guess that I’m just not seeing the incident here . . .
1. Imagine the Croatian leagues, or the II liga Polska, as a river running through a forest beneath an imposing cliff face. Small birds flit from branch to branch; fish dart around in the current. But who’s that bird of prey perched on the rocky crag, ready to drop on any tasty-looking morsel, or promising young midfielder, that it sees? 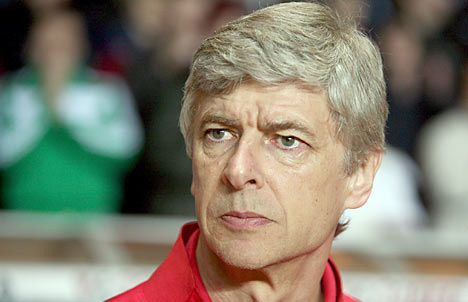 Why, it’s Arsene Wenger! Or at least his scouting network. Hence: eagle-eyed. 2. Did you ever really believe him when he claimed not to have seen some controversial incident on the pitch? I always thought the claims seemed so comical because they were an obvious ironic inversion of the reality that, if it happened on a pitch he was standing by, he would certainly have seen it. Hence: eagle-eyed. 3. What about the crazy viewing room in his basement where he stays up all night watching satellite feeds of matches from all over Europe? It might be voyeuristic, as Mourinho says, and it’s definitely obsessive, but it gives him a wide field of vision. Hence: eagle-eyed. 4. This is more subjective, but the pictures above, especially the first one, portray a stare that looks classically eagle-eyed to me. Sharp, clear, fierce, a little introverted, beaky… Hence: etc. 5. Have you ever seen the Muppets? Can you not imagine the man in these pictures barking “You are all weirdos!” and storming out of the room? I am once again seriously impressed by your argumentative skills, but have to blow the whistle on plagiarism. The quote in no. 5 is taken verbatim from the description of Wenger’s first day of training in Tony Adams’ autobiography . . . In any event, Arsene’s vision must now be marred by a form of avian cataracts, as the effects of blind spots are increasingly apparent. That is by far the most plausible explanation for the presence of Senderos and Bendtner. Brian you fill me as ever with awe, this is so much what I feel about Wenger. He is the classic disappointed parent where it is all the world that has let him down. Not that he *expected* better precisely, but the he somehow still *hoped*. A very well written piece. “Tragic hero” is perfect. That was breath-taking! At least twice, but maybe three times, and in such a short time. This – “Having lost his innocence in the fight, which he won, to keep his innocence” – is the peak. An impressively high peak. Surrounded by mystic clouds and populated by eagles, all of them Wenger-eyed. Brian Phillips, I’ve just understood that I’ll be reading what you wrote and will write for a very long time. I’m going to print it out and put it on me wall. Damn, well said! And to think that he is still persisting with his philosophy – even after 2 years of this article being published. The Run of Play is a blog about the wonder and terror of soccer.